I didn’t want to write about the mid-term elections this year. I refused to get involved nor did I want to know anything about the campaigning. When I came across a bunch of flag waving, singing, partido (party) supporters, I hurried away as fast as my moto could take me. But, the story is just too good not to share. So here it is. Election campaigning is of a very limited nature. Parties can begin their hoopla on April 5 and must end it all, I mean dead silence, three days before elections on June 4. (Get facts about Mexicos 2015 midterm elections) This time, June 7 fell on a Sunday, so no breath of public advertising was permitted beginning on Thursday. Mexico also enforces la ley seca (the dry law) the period before the election under the belief that sober voters make fair elections. No alcohol can be bought the day before the election. Again, since this was a weekend election, the dry period began Friday at midnight and lasted until Monday. But during those campaigning days, what a hoopla it was! It was a far cry from the last local elections with conch shells and matracas (See Politicking) If I were to hazard a guess, the major political parties received huge infusions of campaign funds this year. Every partido (party) had two or three custom painted vehicles, complete with mounted sound systems to blare out the party jingle all day, every day of the campaigning period. Everybody had oodles of party labeled flags to give out as well, not to mention bags, aprons, hats, shirts, water bottles, balls and other promotional gear. Two of the partidos (parties) even had mascots. Partido Verde (The Green Party) marched about with their Toucan and PAN (National Action Party) had a Gallo (rooster) referring to the nickname of their current candidate–El Gallo. PES was the only political party not represented in Moroleon during the 2015 mid-term elections. Election day had low voter turnout and plenty of funny business. Several members of PRD were caught buying votes and arrested. A half-page article appeared in the local newspaper categorically denying any vote buying activities by said family. Curiously enough, the accused are close family members of the current PRD president of Moroleon. Voters from los ranchos (small towns and villages that fall under the jurisdiction of Moroleon) have been heard to say that members of the local cartel did their own campaigning for PRD. So nobody’s surprised that PRD won the election. That’s not to say PRI didn’t do its own vote buying. They just didn’t buy enough, this time around, coming in a measly second. The third runner-up was the candidate for the little party, Movimiento Ciudadano, which was quite a surprise. Had the elections been fair and the vote buying parties disqualified….well, that’s just too much to think about. The neighboring town of Uriangato also had their share of shenanigans. Once the votes were counted, Partido Verde and PRI tied. The odds of that happening by chance seem astronomical to me. Partido Verde demanded a recount and were subsequently declared the winner. I’m not sure how many consecutive terms a local mayor can have, but the newly elected candidate is on his third term. Maybe, this time, he’ll be able to get board approval for the international airport he wants to build. I just bet he knows the perfect place for it and would be able to give the airport a good price….wink, wink. I can just imagine the posh visitors from Milan or London stepping off the plane to….. 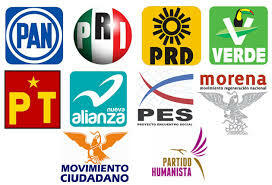 Nationally, PRI was the clear winner in the majority of local elections. Hmmm, could it be that the current PRI president, Peña Nieto, had a hand in that? Or perhaps it was the dispensa (gift) pictured below distributed to many municipalities? 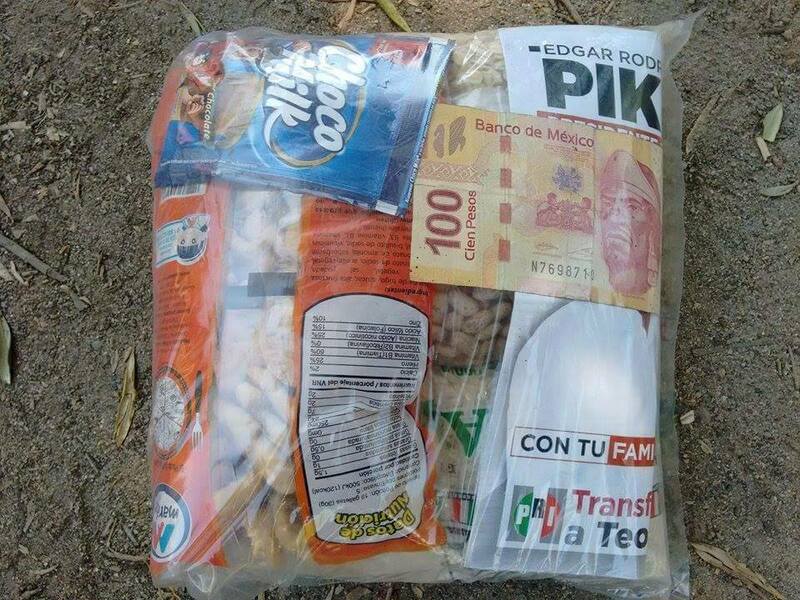 This is the dispensa, give away, from PRI in Teocaltiche, Jalisco during the 2015 mid-term elections. Some candidates were taken out before election day. Also during the bloody election period, at least 7 candidates were murdered and another 20 dropped out due to death threats, in attempts to control the outcome of the elections. One of those candidates, Enrique Hernandez, was elected posthumously in Yurecuaro, Michoacan, confirming the fact that the only good politician is a dead politician. Other areas opted out of the election process altogether. In Oaxaca and Guerrero, protesters burned ballots and refused to allow the elections to proceed. The military was sent in to restore order and killed yet another future teacher of Ayotzinapa. Thousands attended his funeral.